By Road: The postcode for your Sat Nav is SL4 5TZ. 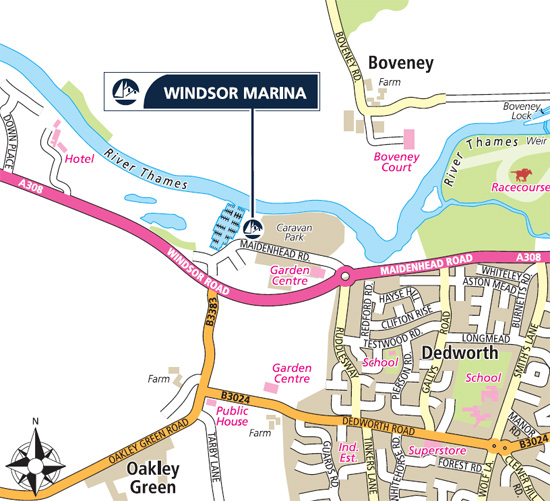 Situated on the outskirts of Windsor town on the south bank of the Thames, Windsor Marina is easily accessed by leaving the M4 motorway at Junction 6 towards Windsor. Then take the slip road off the dual carriageway signposted Maidenhead/Windsor. At the roundabout turn right onto the A308 towards Maidenhead and proceed for 2.5 miles. The marina can be found by taking the third exit at the garden centre roundabout. By Rail: Trains from London Waterloo run frequently to Windsor, from where it is a short bus ride to the marina. 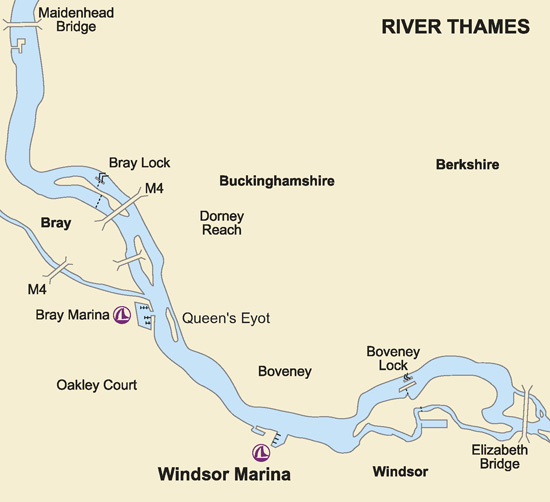 By Boat: Windsor Marina is on the south bank of the River Thames, 3 miles upriver of Windsor Castle. 1 mile after Boveney lock enter the marina to port. From upstream, pass through Maidenhead and Bray’s flowery lock, under the M4, past Monkey Island, Bray Marina and Queen’s Eyot. Windsor Marina is to the starboard 1 mile ahead.